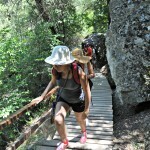 Day 525 In Beijing: Blue Tour In Cappadocia, Rug Throwing Video. Getting ready to throw the rug. Jill and I kept the best video for last. At least, in my mind, it is the best. It shows how much the rug changes color depending on where the rug is seen by the viewer. 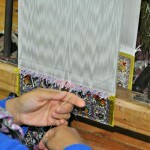 The rugs are weaved specifically to do this so the owner can basically have two different rugs at one time. It is a heck of a deal, as some of these rugs were only a few hundred dollars, and if you think of the months of work that these women put into them, that isn’t very much money. We just loved the colors, the brightness, and the wonderful designs on all these rugs. We wish we could have bought some of them but since we are going as minimalist as possible, it didn’t make any sense. So, we just have memories and that is enough. 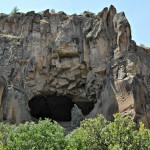 Day 524 In Beijing: Blue Tour In Cappadocia, Rug Co-op Videos. 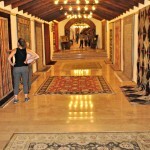 After our guide led Jill and me down the Hall of Rugs, he took us to a massive private room. We knew what this was about as Jill had gone on these before and warned me: this is the sales pitch. 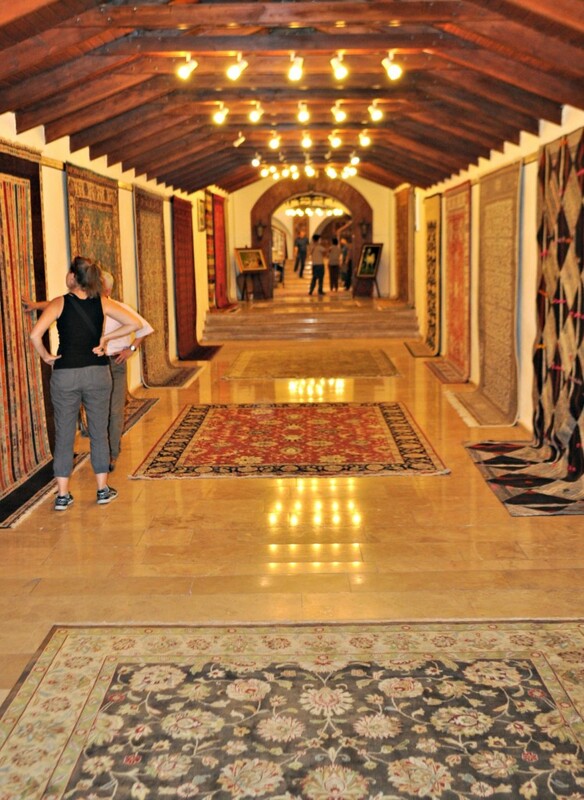 They show you lots of rugs, many more than you can even imagine, and try to tempt you into buying one. The Turks are very good at bargaining and pressuring people to buy, in a nice way, but since we lived in China, where bargaining and pressure tactics are at a graduate level, we weren’t worried about saying no and walking out without buying anything. Jill and I plan to keep traveling the world for the next 10 years and so that tends to make it impossible for us to buy things since we won’t really have a set place to store then nor do we really want material things to weigh us down. I’m actually writing an ebook on minimizing and how to be more efficient at this moment and it is really coming along nicely. We were then able to just enjoy the show and be caught up in the full attention the salesman, and his attendants, gave to us. As well as the Turkish coffee, and apple tea, that they gave us. 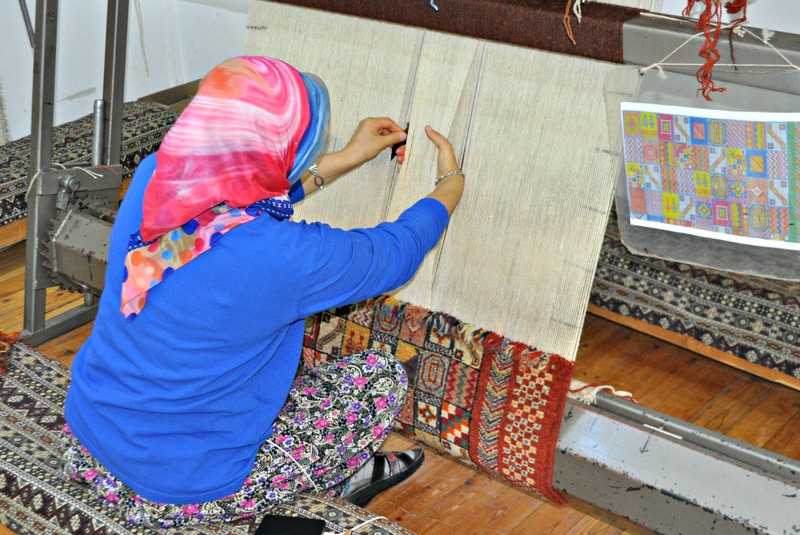 Take your time watching the videos and enjoy the skill, and style, that these men use as they showed us at least 50 different rugs, from different materials, and different areas of Turkey, and different sizes and shapes. The man throwing the round rug was our guide for the Co-Op tour. They let me walk around on the rugs as they were putting them away. Day 524 In Beijing: Blue Tour In Cappadocia, The Hall Of Rugs. After seeing the women weaving the rugs, our guide took us down a long corridor best described as the “Hall of Rugs” sort of like the Hall of Fame. 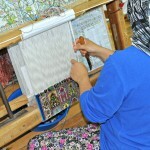 He told us more about the history of rug making in Turkey and the conditions the women used to work in and how they are better now. He also told us that he loves his job and enjoys being able to show people this amazing art each and every day. When he spoke, you could hear the pride in his words and see it in his eyes. This is someone who had found a job that he loved and was very proud of doing when he woke up. We looked at our guide and asked, “So we aren’t allowed to take pictures in this hall?” in hopes that he’d let it slide. Jill and I guessed the reason why, as we’ve been living in China for just over a year, but wanted to hear what our guide’s reason was just in case we were wrong. Jill and I laughed at the absurd reality of the situation and started taking a few pictures just to document our trip through the Hall without being obvious or rude. It is about fitting in, for us, as we like to be tourists but also want to be the kind of tourists that aren’t that noticeable all the time. 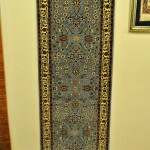 There is no way I can show, through pictures, the incredible detail and exquisite workmanship of these rugs. 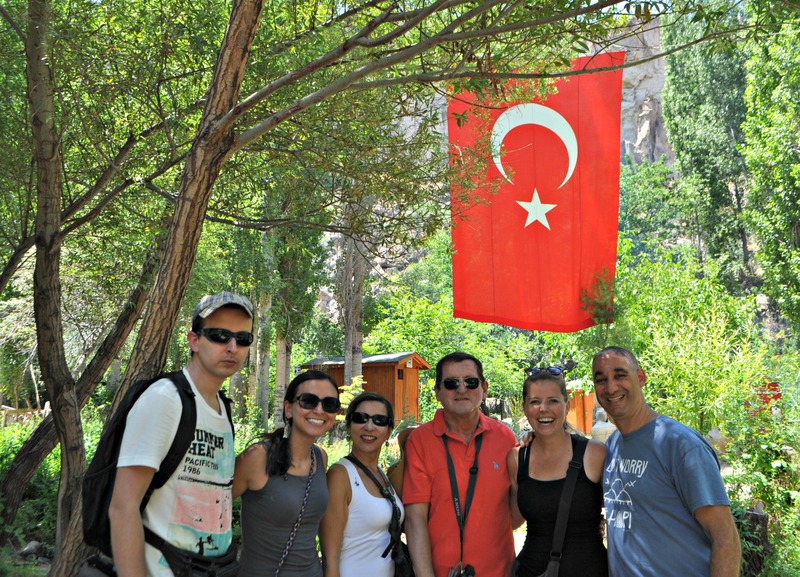 You have to visit Turkey yourself to see, and understand, them and how the culture informs their artwork. 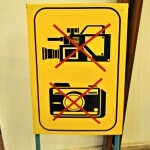 No picture and no video. Applicable to Chinese people only. A more modern design on this silk rug. Day 523 In Beijing: Blue Tour In Cappadocia, Rug Co-op Videos And Happier Than A Billionaire. Working on a larger rug. Jill and I were totally absorbed watching the women weave. They were lightening fast and we couldn’t believe that they could do this, day after day, without suffering major pain or injury. I’m guessing they did but the money they could make before they retired, around the age of 40, would hopefully be enough to support them and their family. We didn’t ask them what their husbands do, and for all we know they work at the same co-op selling the rugs, but I’m guessing they don’t make a lot of money doing this and it is a tough life. Even with the percent the co-op gives them, I’m sure they struggle. It gives Jill and me even more reason to be thankful for what we have in our lives and how we are able to live them. How many people get to move to China, on a whim, work 3 days a week, and then travel around the world living a rather wonderful life? Not that many that I know although, as we travel more, we meet more and more people doing this and are inspired by them. One of the people we’ve met is Nadine Hays. I starting reading her book, “Happier Than A Billionaire” while we were on vacation and loved it beyond belief. Well, we haven’t actually met her in person, but we met her through her book, and then on Facebook, where we’ve become fast friends already! It is a travelogue about a couple, in their 30s, that decide to chuck the jobs they hate and move to Costa Rica. Jill has visited Costa Rica before and thought it would be a fun read but didn’t have time to read it, so I borrowed it from her. I now want to visit Costa Rica as soon as ppossible Nadine’s book is hilarious, scary, and amazing. 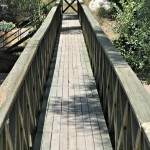 It is everything that can happen living an expatriate life and both the good and the bad. She leaves nothing out and she and her husband, Rob, do an amazing job of overcoming whatever is thrown in their path to make their dream life. She’s now written two sequels and continues to live the dream. I would suggest anyone, whether you want to actually live the expatriate life, or just read about it, buy her book and read it immediately. Just click the Amazon link below and buy it. It is a deal at $2.99 for a kindle version! 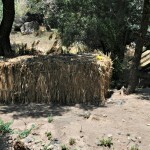 Back to the women weaving, making their lives their dreams, and Turkey. This is a short video showing the women moving as fast as humanely possible. This video is longer but the guide explains exactly what is happening as it goes along. 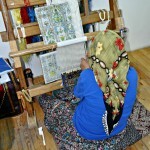 Day 522 In Beijing: Blue Tour In Cappadocia, Rug Co-op. So intricate and so perfect. Jill, the tour group, and I head off to our next destination, a rug making co-op. 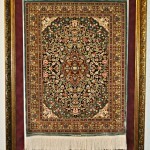 I grew up, as I’m part Armenian, with a lot of Armenian rugs around my house. It was the one bit of that culture, other than dolma and pilaf, that my family brought with it from Armenia when they moved to the USA many years ago. 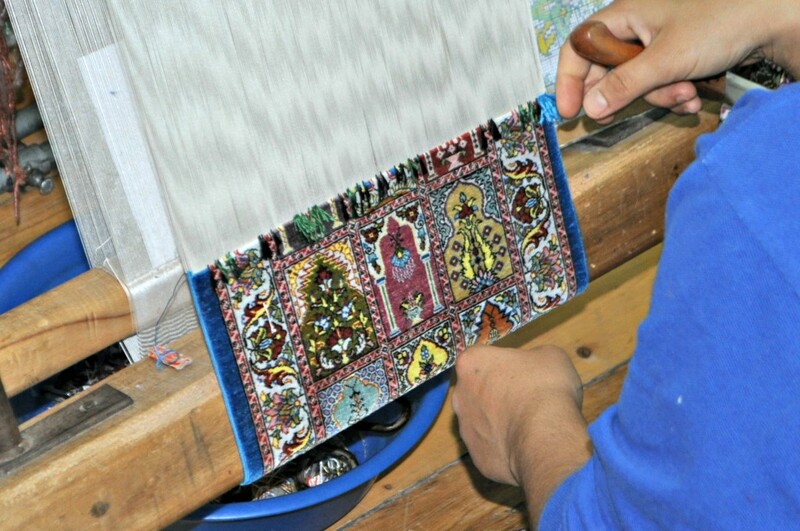 I love looking at them, and the intricacies of how they are woven, and was extremely excited to see people at work and making these beautiful pieces of art. Each of us received our own tour guide, with the Colombians getting someone that spoke some Spanish and English, as that is what they spoke also, and the Dutch getting someone who spoke German. 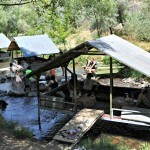 Let me say this, the Turkish have the tourist industry down to an art. 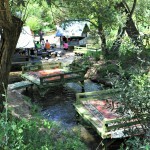 They have so many guides, that speak so many languages, it is rather amazing. They really know what they are doing and how to make people feel comfortable. As an Armenian that is a lot to say when you consider the history between these two countries and the massacre that happened against the Armenian people back in the early 1900s. I’m glad to say that when people asked where I’m from, and I told them Armenia, they were excited and stated that “We are brothers!” It was great to hear that these old hatreds are disappearing and people are becoming more inclusive and caring. I’m not sure about Eastern Turkey, where it is much more religious and provincial but Western Turkey is fairly open-minded at this point. 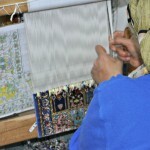 Our guide told us about the work these women do, and how difficult it is, and how it is a dying art. The women are only allowed to work for 20 minutes at a time, and then take a 10 minute break, so that their hands, and eyes, won’t be injured. They are also only allowed to work for 4 hours a day. Many work from home since they have kids and other duties to do so they only come into the co-op to deliver their rugs or work in front of tourists. According to our guide, many of these women retire at around 40 years old because of the stress and strain to their bodies from doing such repetitive and tedious work. That is just another reason why this art is dying out and younger people aren’t interested in doing it anymore. 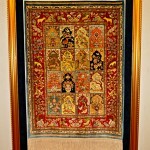 One of the bigger rugs (5 feet by 9 feet) could take about 9 months to make one if it is cotton. 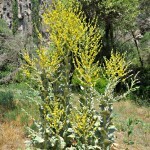 If it is silk, however, it can take double that or almost 1.5 years. The women get about 70% of the sale while the co-op gets 30% so it seemed like a pretty fair deal for them. 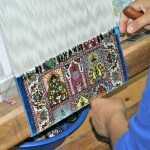 An artist working on a tiny silk rug. 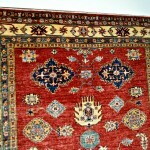 A close up of the silk rug. 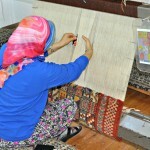 A close up of her hands on the silk rug. Day 469 In Beijing: The Grand Bazaar, Part 2. People mingling and rugs hung on the wall outside The Grand Bazaar. Jill and I kept walking around, feeling like we were in Wonderland, and starring at all the beautiful creations that humans have made and have on display. However, there is something that we noticed after living in Beijing and traveling to massive cities. I guess we are getting older, Jill at 41 and me at 45, but I don’t think it is that. If it was, we definitely couldn’t deal with Beijing, and we can deal with it pretty well, all things considered. We just realized that we wanted a little down time and a little quiet. We’d seen so much in the past 2 days, after flying for 12 hours, that we would need a break. So, we didn’t stay as long as we would have usually stayed but we still felt quite satisfied in what we saw at The Grand Bazaar. It is an amazing place and one could easily spend a full day in it and just get lost wandering around, talking to the salespeople, and seeing pretty much anything one desires, on display. Speaking of salespeople, that is another thing we are tired of after living in China: Bargaining. It is also what happens in Turkey and we just aren’t fans of it. Just give us a fair price and we will pay it. It just becomes so tiring to bargain for something, especially when you just want to look and take your time, and the salespeople jump on you and start telling you prices when you don’t even want anything. I’m sure they make a lot of money but, for us, it just makes us want to leave and not even look at something we might want to buy because we don’t want to deal with the drama. That is another reason we didn’t spend a lot of time in The Grand Bazaar since all the salespeople immediately call to you and start telling you to come in, try their goods, and whatnot. So, we ended up taking off after about 1 or 2 hours. It was still amazing and definitely worth the trip. We just needed a little quiet and thought it would be nice to go back to our friend, Andac’s apartment, enjoy some yummy Turkish white cheese, bread and wine. Day 454 In Beijing: Mike, The Mayor Of Istanbul. Jill and Mike, the Mayor of Istanbul. After seeing the Hagia Sofia, The Basilica Cistern and the Blue Mosque all in one day, Jill and I needed to visit her dear friend, Mike. Mike is rather famous in Istanbul, and for that matter, much of Turkey. He has been around, for what seems like forever, and he and his brothers used to own the Kybele Hotel. It is utterly gorgeous. He also has a jewelry and rug store, right beside it, and they used to actually have a connector door so you could go from one to the other. Jill hadn’t seen Mike since 2011, when she visited Turkey last time, and so she wasn’t sure if he would be in or on vacation somewhere. Mike is known as the “Mayor of Istanbul” because everyone knows him. 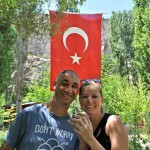 He is able to connect you up with whatever you need, whenever you need it, and Jill has seen him on documentaries about the city of Istanbul. He is also an incredibly gracious and wonderful person. We walked in, and he asked us to sit down, and we shared tea with him. He asked us about our trip, Jill’s and his friends that they have in common, and what we were doing and planning on doing in our future. We asked him about his life and what has changed. He seemed like he was incredibly happy, and content, with his life. 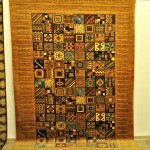 He also showed me a bunch of utterly gorgeous and amazing rugs. I wish I had a place to put them because I’d love to own them. He also noticed my name and asked if I was Armenian. I’m always a bit nervous about letting Turkish people know I’m Armenian because of the genocide and the history between the two countries. However, every single Turk that I’ve met, and told this to, always seem happy that I’m there and that the past isn’t stopping me, and then, from seeing each other as human beings. I always bring up how we are all the same and that we can change the way we perceive each other and the world. Everyone agrees and it is very nice to see that kind of acceptance happening. Just one more reason I love to travel and connect with others. After hanging out with Mike for about an hour, we went down to his jewelry store and look at everything for sale. It was all very fairly priced, and gorgeous, but we didn’t buy anything as we are traveling light and just wanted to wait and see what we would find on our trip. Mike’s family is also quite famous because they were the first family to produce the gorgeous lights, that you can see in the pictures below, in mass quantity. They did very well off of them and then bought the Kybele Hotel and the store beside it. After selling the hotel, Mike has decided to branch out and do other things. I can’t wait to see what he does next as he seems be a very intriguing, and innovative, person.